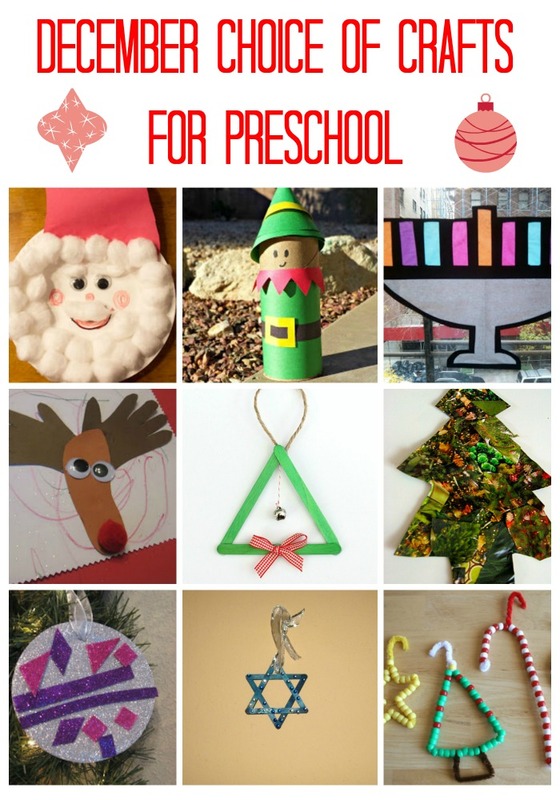 What are some easy crafts that preschoolers can enjoy in December? I picked some for us to try this year. This post has been updated with a new graphics in November 2015. I also replaced several outdated links with fresh links to similar crafts. As you know, I am the least creative person in the world as far as crafts are concerned. Therefore I just love looking for ideas in the blog world and on the craft sites. I found so many terrific ideas, but I have to be realistic about our December load. So again I created a page with 9 different choices for Smarty. Every day when we have time for crafts, she will get to choose one of those nine projects to make (3 choices at a time). I am hoping to get all 9 of them done. I deliberately excluded snowflakes and snowmen, because I thought that it would be nice to continue winter theme in January. Perhaps Smarty will get into the crafting spirit, and then I have a lot more ideas stashed. Do you have a favorite winter holidays craft for preschoolers? We did the popsicle Christmas tree earlier this week and it was a lot of fun! Of course, after awhile Tommy got bored with the idea of making a tree and so I let him have the bottle of glue and the popsicle sticks...he ended up making a sort of Lincoln Log creation. I also like the idea for bead ornaments and the star, I think we'll do those next. Have fun. Some neat craft ideas here. Selena for some reason just wants to do patterns. She could care less about actual crafts. All of those look like fun! D is not that in to crafts right now so we will have to see what we get to do. I really like the bead ornaments. How are you modifying the star? All in all looks like some fun crafts. I like your idea to let Anna choose crafts like this!